On the following pages more information about the skills and equipment on the fields of power electronics and electrical machines can be found. At the Institute of Electrical Engineering several converters with different power levels have been developed. They can be used for various applications, e.g. converters for electrical machines, active-frond-ends, as DC-DC-Converter or in combination with electrical energy storage systems for their integration in the power grid. 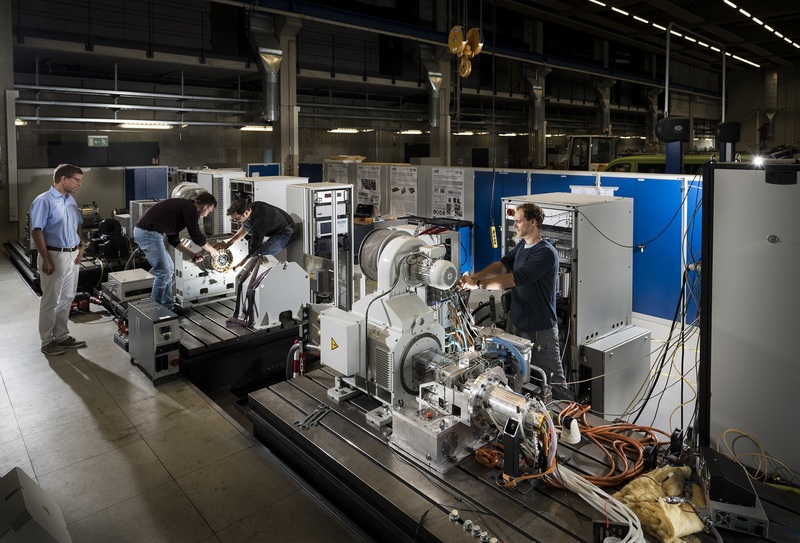 For the characterization and parametrization of electrical machines several motor test benches are used at the Institute of Electrical Engineering. Especially at the new location at the Campus East of the KIT completely new test benches are built up, which are appropiate for testing traction drives. At the Institute of Electrical Engineering a power semiconductor test bench has been developed. The fully automated, LabVIEW based test bench makes it possible to analyze the turn-ON and turn-OFF behaviour and evaluate the losses of both Si and SiC power semiconductors.